The rules of Yacht Racing are found in the Racing Rules of Sailing (RRS) (which govern the sport of sailing on the water) and the Sailing Instructions Guide. The flags used are called "RRS Race Signals". They are revised and published every four years by World Sailing). The current edition is "The Racing Rules of Sailing 2017 - 2020". As a result of actions taken by the World Sailing Racing Rules Committee and the World Sailing Council during the Annual Conference, changes may be made to the RRS during the four-year period. These changes are published as Changes and Corrections to the RRS. Also, "Sail races are governed with flags and sound signals to indicate flag changes. The flags used are taken from the International maritime signal flag set (or International Code of Signals). During a race and for any signal concerning the race, these flags are defined in the RRS but the signal can be modified by the Sailing Instructions. The raising (hoisting) or removing of a visual signal is accompanied by the emission of a sound signal to draw attention to the new signal. The type of the sound signal (one short sound, two short sounds, one long sound, etc.) is described by the rule according to the type of signal (then a comprehensive arrangement of signal flags follows." "Different classes of racing yachts have their own flags. These flags are used during races. If, for example, the flag of the yacht class is accompanied by one of the conditioned signals of the race (for example: "Race delayed", "Race discontinued", etc. ), this means that this signal applies only to this class of yachts. 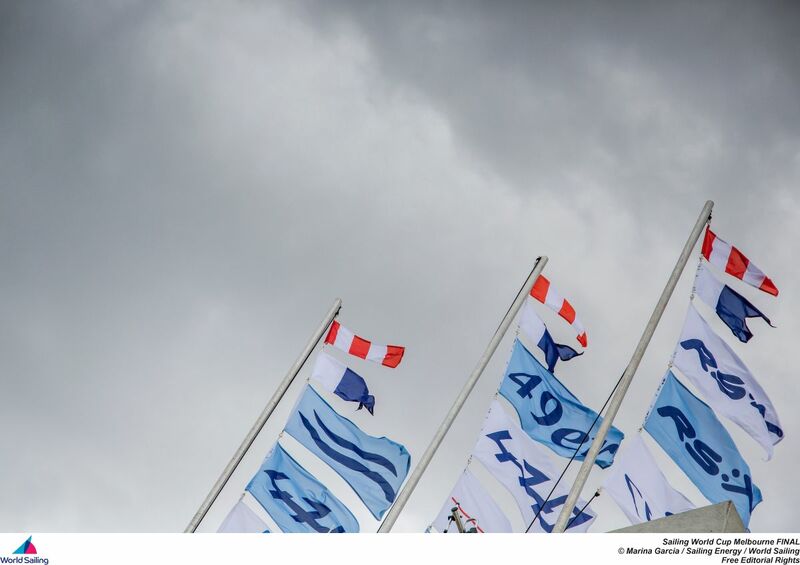 All the flags of the yacht classes are white with black logos (the same logos are applied to sail yachts). Source: http://www.vexillographia.ru/yacht.htm (the information found on this website is taken from the Children's sailing school "Rautu" (St. Petersburg) (former semi official website: http://rautu.boom.ru/, currently available at official website: http://rautu-team.ru). For a more thorough and up to date list of Classes, please refer to: https://en.wikipedia.org/wiki/List_of_sailing_boat_types. 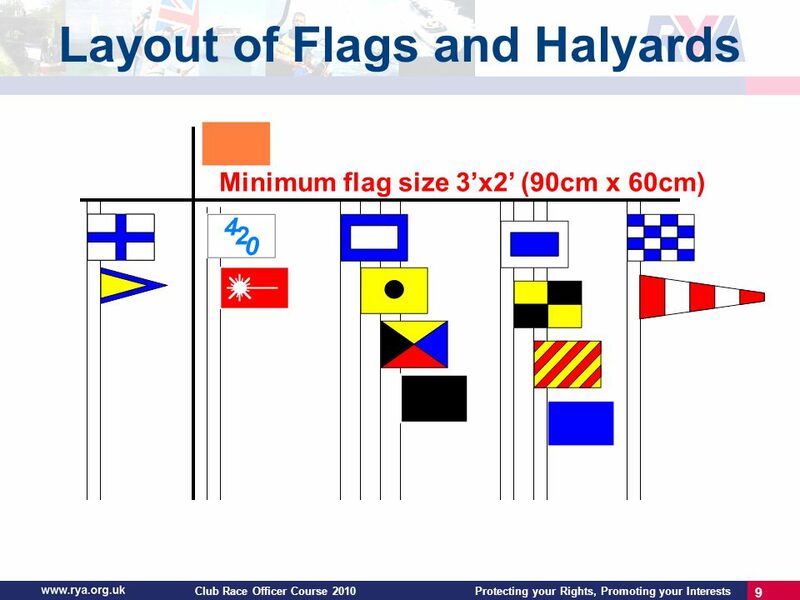 The flags can be displayed as seen at http://images.slideplayer.com/15/4826155/slides/slide_9.jpg (source: http://slideplayer.com/slide/4826155, a slideshow from the UK's RYA (Royal Yachting Association) Club Race Officer Course). In this image one can actually see not only signal flags, but also Class Yacht flags (more precisely the image displays the "420" and the "Laser" Class Yachts (the "Laser" Class displayed here is a variant, having a red background instead of white), in the second pole, from left to right, and from top to bottom). Also, the minimum size of flags is 3' x 2' (60 cm x 90 cm), as seen in the same graphic above.